The past eight years or so have really been the glory days for self-publishing. 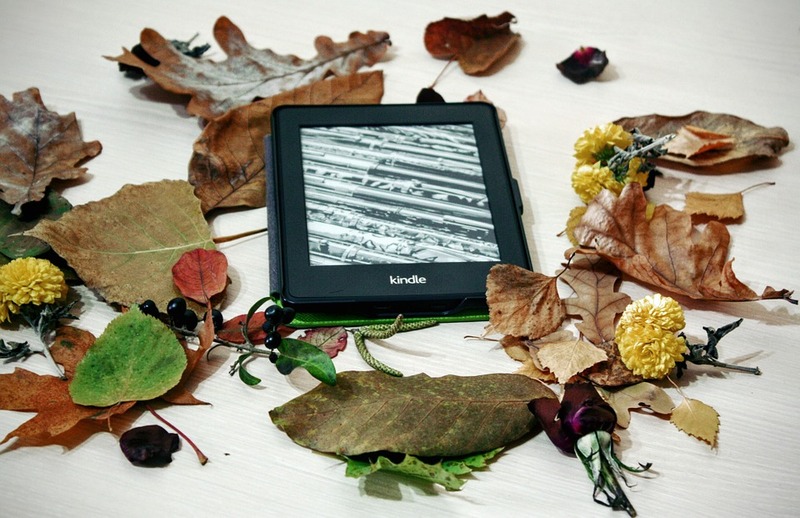 Since the advent of Amazon’s Kindle in 2007, writers (and “writers”) and novelists (and “novelists”) have come out of the woodwork, now producing nearly half a million self-published eBooks every single year – and most of them, to be frank, aren’t really any good. Writing aside, the actual quality of the vast majority of these publications leave a lot to be desired. There are lots and lots of platforms out there that will ‘publish your eBook for free in minutes!’. And that sounds great to budding young authors (and I’m speaking from experience here). With a few thousand words saved on a laptop, it is indeed very simple, and often free, to self-publish an eBook and have it for sale on Amazon, Lulu, iBooks and all the rest in no time. The only trouble is that most writers (and especially “writers”) produce their documents using a word processor – Microsoft Word or Google Docs usually. Now, whilst these programs are brilliant at doing what they do – processing words – they are not at all designed to produce text that can be immediately bunged across to an e-publisher and be formatted correctly for e-readers. I’m sure you will have read eBooks that just look awful – this below, from the-digital-reader.com, is in fact a rather tame example. However, even though the only real problem with this page is that new paragraphs aren’t indented, you can see how just this one tiny lapse of detail makes the whole thing a real headache to try and read. It’s just awful, isn’t it? The convention in print publishing, as you will know, is to begin new paragraphs with an indented first line (on the web, new paragraphs are not indented, but there is a blank line space to separate them (as in this blog post that you are reading right now)). 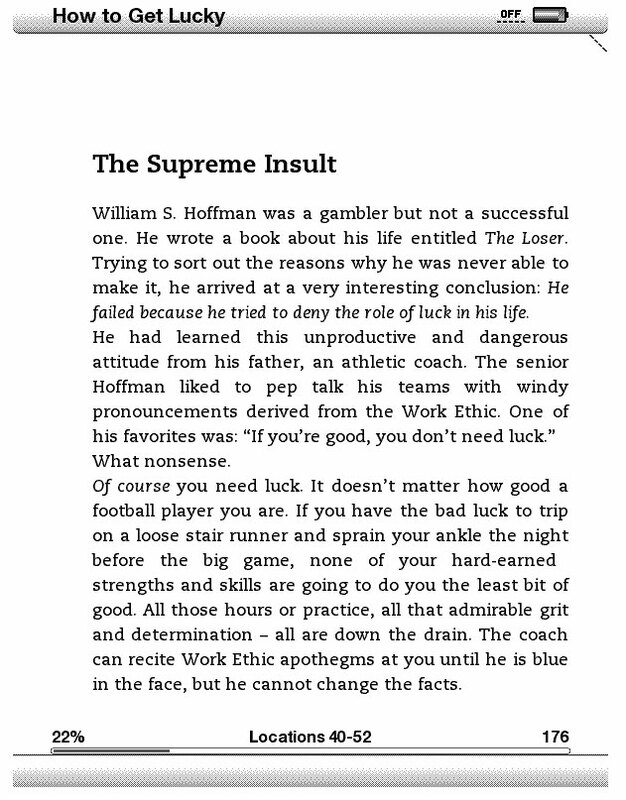 Now, the likelihood is that Max Gunther, the author of How To Get Lucky from which the above extract is taken, would indeed have written his prose, obediently indenting the first line of every paragraph in his Word document, and it would have all looked great. However, when he (or whoever it was) copied and pasted all of his hard work into the e-publishing program, all of that essential formatting was lost along the way, and resulted in the mess that you see above. Self-digital publishing has only properly taken off over the past 4 or 5 years. Back in 2011, InDesign was still primarily a program for designing print material (and that is still it’s primary function, in fact). Adobe’s version of InDesign then, although it did offer a method of exporting eBooks, was still rather basic, and once again formatting issues were rife. “Even then, there were many things that would have been needed in a professionally published eBook that would require additional work post export from ID. Such post-export work is referred to as ‘cracking’ the eBook, and would include coding of HTML, CSS, XML and other attributes. All of this was generally beyond many book designers and DTPers. Indeed, even with the 2014 release of InDesign CC, Adobe still haven’t made it so that the application will completely alleviate the need to standardise the text styles that you will use in your word processed manuscript – but they are working on it, and one day soon, no doubt, an update will be rolled out that will be the complete solution for e-publishing with InDesign. Up until the 2014 release of InDesign CC, the application gave only one format option for creating eBooks – reflowable. This was great for e-publishers – and still is for mostly text-based publications – because reflowable EPUBs can be uploaded to all retailers and work on pretty much every eReading device that you’ll find on the market. What ‘reflowable’ essentially means is that the text will shape itself to fit the screen that it’s being displayed on. So, for example, if you were reading an eBook off your tablet, and you switched from landscape to portrait, the text would automatically ‘reflow’ into the now narrower but taller screen space. It also means that text can be enlarged on screens without loosing any essential formatting. Virtually all fiction titles and non-fiction such as biographies, business books, memoirs are produced as reflowable formats. Plain-text publications are not the be all and end all of the electronic publication industry any longer, however. Indeed, children’s books, cook books and art books are very popular on eReaders as well, and of course all of these are image heavy and complexly designed publications. What this means is that the visuals, the design, and the imagery are often extremely important factors of the eBook. For instance, in a cook book, the written recipe needs to stay in place adjacent to the pictures of the finished dish. Bearing this in mind, a reflowable eBook wouldn’t work in this scenario, as the text needs to stay fixed where it is, just as if you were reading a printed book. Content in these types of books need a fixed place, and so InDesign now offers the fixed-layout option, so that everything stays in place when displayed on the eReader exactly as it was on your InDesign page. So, Which Is Right For My Publication? The best way to answer this is to give a series of pros and cons for each format. Figuring out which format would be most suited to your eBook is only the first step of creating the publication. 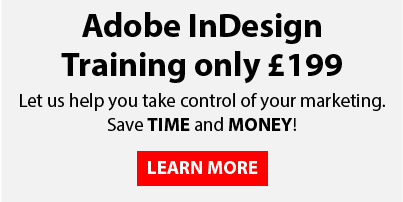 Book Now on one of our InDesign training courses and get ready to see your book hit the digital shelves by storm. What format would you suggest for a foreign language grammar book. It has tons of charts and columns. And by necessity the book needs embedded sound that can provide click/hear capabilities even offline. But if it is so small that someone can’t read it on their phone . . . What should I do?